“The Services have designated 276 deficiencies in combat performance as “critical to correct” in Block 3F, but less than half of the critical deficiencies were addressed with attempted corrections in 3FR6”, the report states. 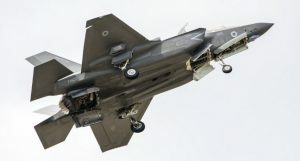 There remain “hundreds” of critical performance deficiencies and maintenance problems, the report says; Dr Gilmore also doubts about the F-35A’s ability to succeed either as an air-to-air or an air-to-ground fighter. In an analysis of the report at the Straus Military Reform Project, picks over the report in detail. The problem with the wing design makes the F-35 a challenge to fly at around the speed of sound: “All F-35 variants display objectionable or unacceptable flying qualities at transonic speeds, where aerodynamic forces on the aircraft are rapidly changing. Particularly, under elevated ‘g’ conditions, when wing loading causes the effects to be more pronounced, pilots have reported the flying qualities as ‘unacceptable’,” the report states. As a close support aircraft, Dr Gilmore’s report says, the Electro-Optical Targeting System is hamstrung by low resolution and range. That means if pilots are trying to single out a ground target, they need a first approach that’s too close to use guided weapons, so they have to blow their cover, then circle back to a safe distance before launching an attack. A pilot might revert to the cannon in such a circumstance, but at the moment, that doesn’t work either. To maintain its “stealthy” radar profile, the F-35A has a door to conceal the gun. Opening the door to fire the cannon pulls the aircraft off-target – something that needs a fix in the plane’s software. Yes, that software. The F-35’s software also comes in for criticism, with Dr Gilmore writing that the December Block 3FR6 release isn’t mature enough to “complete the remaining test points”. As well as the gun aiming issue, the “Air-to-Air Range Infrastructure” remains behind schedule. Even if the cannon were usable, it’s not much help in a ground support mission, because as Straus notes, the F-35s can only load up with a couple of hundred rounds (the A-10 Warthog carries more than 1,000 shells for its 30mm cannon). Flight testing “continues to be a source of significant discovery”, the report drily notes: there are fatigue problems in the tail; the arresting gear on the F-35A variant is good for one landing only; the F-35A and F-35C show excessively high air flow temperatures around the engine; and the horizontal tail overheats in a Mach 1.5 run.